Land Destroyer: Warning: Nuclear Deal With Iran Prelude to War, Not "Breakthrough"
Warning: Nuclear Deal With Iran Prelude to War, Not "Breakthrough"
July 14, 2015 (Tony Cartalucci - LD) - Originally posted in November of 2013, the article, "Nuclear Deal With Iran Prelude to War, Not "Breakthrough,"" warned of a premeditated, documented conspiracy to use a monumental "deal" with Iran as a pretext not for peace, but in fact, for war and regime change. Hysteria now sweeps the headlines across the Western media regarding a "historical nuclear deal" that "Obama made" that vindicates the Nobel Peace Prize he was "prematurely awarded" so many years ago. For those aware of the ruse at play, such sentiments are to be inevitably and completely betrayed by what is sure to follow. The global public must remember there is currently a war raging in Syria on Iran's doorstep. The sole purpose of this war, organized and directed by the West, fueled by billions in cash, weapons, and flooded with fighters organized and trafficked from across the globe by NATO and its allies, is to destroy Iran's chief regional ally before inevitably destroying Iran itself. If the war in Syria is still raging, then one can be assured that the proxy war in turn being waged against Iran is still raging. "...any military operation against Iran will likely be very unpopular around the world and require the proper international context—both to ensure the logistical support the operation would require and to minimize the blowback from it. 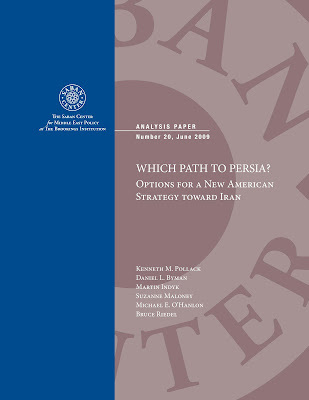 The best way to minimize international opprobrium and maximize support (however, grudging or covert) is to strike only when there is a widespread conviction that the Iranians were given but then rejected a superb offer—one so good that only a regime determined to acquire nuclear weapons and acquire them for the wrong reasons would turn it down. Under those circumstances, the United States (or Israel) could portray its operations as taken in sorrow, not anger, and at least some in the international community would conclude that the Iranians “brought it on themselves” by refusing a very good deal." -Brookings Institution's 2009 "Which Path to Persia?" report, page 52. Written years ago, as the US, Saudi Arabia, and Israel were already plotting to overrun Iran's neighbor and ally Syria with Al Qaeda to weaken the Islamic Republic before inevitable war, this quote exposes fully the current charade that is the "Iran nuclear deal." The West has no intention of striking any lasting deal with Iran, as nuclear capabilities, even the acquirement of nuclear weapons by Iran was never truly an existential threat to Western nations or their regional partners. The West's issue with Iran is its sovereignty and its ability to project its interests into spheres traditionally monopolized by the US and UK across the Middle East. Unless Iran plans on turning over its sovereignty and regional influence along with its right to develop and use nuclear technology, betrayal of any "nuclear deal" is all but inevitable, as is the war that is to shortly follow. Exposing the duplicity that accompanies Western "efforts" to strike a deal will severely undermine their attempt to then use the deal as leverage to justify military operations against Iran. For Iran and its allies, they must be prepared for war, more so when the West feigns interest in peace. Libya serves as a perfect example of the fate that awaits nations reproached by the West who let down their guard - it literally is a matter of life and death both for leaders, and for nations as a whole.